The Inconsistent Nomad: I ordered what? Trying local cuisine is a fundamental part of travel to a new place. If you go to Memphis without having BBQ, Belgium without trying the chocolates, Naples without noshing on the pizza, or Mauritius without drinking the coconut tea, your experience will be woefully incomplete. A few years back, I realized the fun in ordering or buying something without having a clue as to what it actually is. While backpacking through Bulgaria with a friend, we bought what we assumed would be a plain piece of bread at a market. Upon tearing into it, we discovered that it was filled with cheese. Cheese! Brilliant! We immediately dubbed our find "Bread Surprise" and decided that we must shop at more markets to see what else we could discover lurking inside innocent pieces of bread. We found jams, fruit, herb concoctions, and more cheese inside our purchases as we played this game throughout the country. We were actually rather disappointed to tear into one particular chunk of bread to find it... utterly devoid of anything extra. Well. How boring. Hmph. I tried this again recently in Paris at a nice restaurant. Upon looking over the entrees, I decided to pick one whose description bore not a single word that I could translate. (I don't speak a lick of French to begin with). What did I end up with? Scallops! And they were fabulous. WTF is that and why did the chef forget to cook it? Seriously. Waitress...? I think my dinner is trying to crawl out of the bowl...? 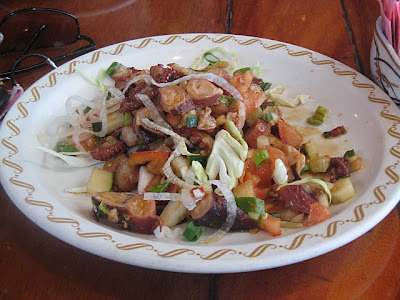 It turns out that tako poki is marinated octopus. I like to consider myself a decently adventurous eater, but the tako poki won this battle. The dish was rather tentacle-heavy, and I would have been able to stomach more of it had the tentacles not been so, well, tentacle-y. Thank God for that Mai Tai that I ordered. At least I could have a liquid dinner. Bottoms up!